of the object viewed. In the case of a double star it falls very rapidly from its maximum to zero; then it rises again, and if the two slits themselves could possibly be infinitely narrow and the light perfectly homogeneous, it would rise to its original value. But because the slits themselves have a certain width, and because the observation is usually made with white light, this second maximum is usually less than the first. 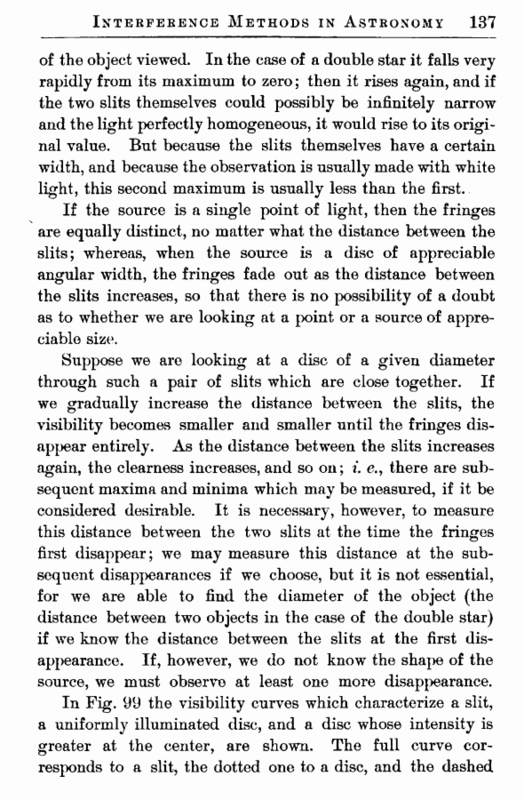 If the source is a single point of light, then the fringes are equally distinct, no matter what the distance between the slits; whereas, when the source is a disc of appreciable angular width, the fringes fade out as the distance between the slits increases, so that there is no possibility of a doubt as to whether we are looking at a point or a source of appreciable size. Suppose we are looking at a disc of a given diameter through such a pair of slits which are close together. If we gradually increase the distance between the slits, the visibility becomes smaller and smaller until the fringes disappear entirely. As the distance between the slits increases again, the clearness increases, and so on; i. e., there are subsequent maxima and minima which may be measured, if it be considered desirable. 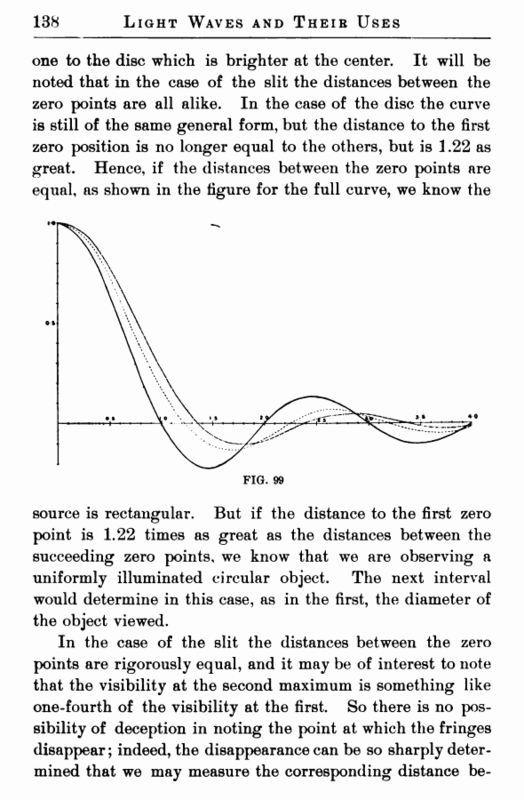 It is necessary, however, to measure this distance between the two slits at the time the fringes first disappear; we may measure this distance at the subsequent disappearances if we choose, but it is not essential, for we are able to find the diameter of the object (the distance between two objects in the case of the double star) if we know the distance between the slits at the first disappearance. If, however, we do not know the shape of the source, we must observe at least one more disappearance.